The shell is constructed with carbon Kevlar fiber stratification and high resistance and absorption thermoplastic resins. The composite fibers keep it light but strong. To ensure this brain cage fits, the rider has the selection of two shell sizes and four internal EPS counter-shells. The right fit is important when it comes to comfort or crash. The padding is removable and washable with hygienic treatment. Hydrofil fibers in the padding will wick moisture away from your head. The lining uses a honeycomb pattern to improve airflow from the venting system. This puts the S4 above its predecessor, the Stealth, which had poor air circulation quality due to the lining. UV protection, anti-scratch, and anti-fog are all included. 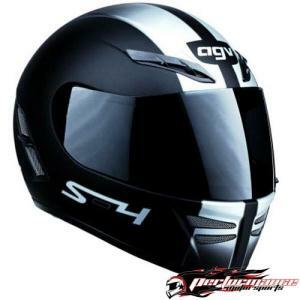 This helmet secures with the standard double D-ring, which I've heard is not true of all AGV helmets. I'm glad this one kept with what works, because I never trust the quick-release retention systems. Now, a company could pick apart every square inch of their product and call it a feature. The price should let you know that you're not getting the best of everything. Their quick-release system for the visor, for instance, is not so quick and feels shoddy. You get the distinct impression that you're going to break it. Also, the helmet is louder than you would think from its sleek appearance. At least none of the compromises were in shell quality. Either way, you'll look good wearing this helmet. No bits of plastic sticking up, an extended chin bar, smooth contours, and a simple but dramatic style make this a great looking full-face helmet.